Meet Lea Spencer, windsurfer/speedsurfer from United Kingdom, his blog http://redsurfbus.blogspot.com/ about the 1000nm windsurfing challenge. I asked more about his interesting challenge. What made you decide to raise money with windsurfing? At the start of 2010 a windsurfing friend of mine kindly gave me some of his old speed kit in return for a donation to charity, I thought this was an excellent way of introducing new people to a different aspect of the sport while also benefiting others. Before he gave me the kit I suffered a heart attack while sleeping on February 13th, it lasted over 8 hours and I have still not been given a good reason why I have had one other than genetics. If I compare my lifestyle and my eating habits to my father then we have lived as complete opposites, but have to accept this reason as we were both around 35 when it happened, I am fortunate that I did not kill me like it did with him. Perhaps I am very fortunate in that I was fit and had a strong heart which has suffered little to no scarring. When I recovered and got back on the water about 5 weeks later I decided to do something in 2011 for a heart charity with a windsurfing challenge. As 2010 drew to an end I finally decided to try to complete 1000nautical miles and raise £1 per mile - giving me a good target to do over a year, and a way of extending the target and raising more money. 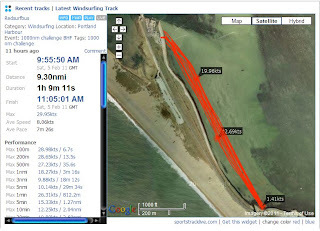 I chose windsurfing as it has taken over my life in the past 3 years, going from a few sessions per year when I started about 5 years ago up to 74 last year and a target of 100 for 2011. I chose the distance aspect so it gave me an achievable target over the year, either with good winds or some long distance slogging this summer in the event of light winds. The mental recovery after a heart attack takes a lot longer than any physical recovery in both my experience and that of others I have talked to. This challenge has helped me overcome the long dark moods that occur quite regularly, it gives me something to look forward to and work towards. I guess in the long run I want to help younger people overcome this side of heart disease and lead normal lives as I have met a few who have become very withdrawn and depressed after suffering. Windsurfing absolutely eliminates any depressed feelings both when on the water and when looking forward to the next session / recovering from the last. In the future I would like to write a small book about this with the hope of helping others in similar situations, this challenge and the people I am meeting along the way will give it some storyline. 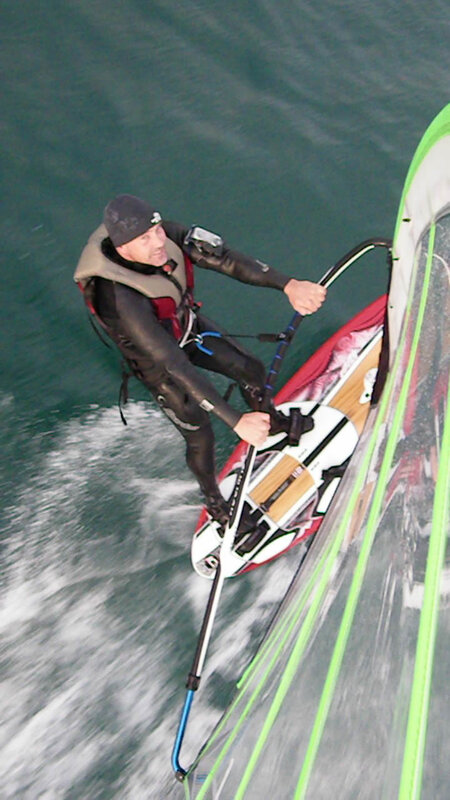 What does windsurfing or speedsurfing mean for you? Windsurfing means freedom and escape to me. I love the sea and was a strong swimmer as a youth. When I changed jobs to become a teacher I took the chance to move from Manchester to the south coast where I could start more hobbies that were water based. I did the usual thing, took a lesson, bought some kit and had a few sessions when the wind was suitable. Over the first couple of years the sessions were few and far between but then about 3 years ago I changed schools and now drive past my local spot (Portland Harbour) every morning and evening. This forced me to buy a van so I was always ready with kit, and of course the quiver has increased exponentially in size to fill the van! Last Wednesday evening in the cold setting sunlight it may as well have been mid summer as I cruised up and down, relaxing and exercising at the same time. I work with a couple of recreational windsurfers like myself, but due to family commitments they do not get as many sessions. Every session with them pushes me forward even more, one of them has windsurfed for years and is very competitive. Due to getting a lot more time on the water than him it means he now gets very frustrated that he is always from 1 knot to 6 slower. This competitive side along with the banter the following day about dropping gybes or rigging the wrong kit brings the child out in me which is no bad thing and breaks the working day up nicely. Since September last year I have sailed with the Portland Pirates who are usually near the top of the GPS team challenge, several of the team members are local and national legends in the windsurfing scene and its thanks to them that I am now learning the speedsurfing side of the sport. Even though I felt I had not much to offer other than distance sessions for the team rankings I found that on 3 occasions from September to December my scores counted to the overall team score for the month which has made me happier than winning anything for myself. It is the first time I have participated in a team that I have truly enjoyed it. So far this year I sailed my first 30+ knot average and have learnt how to watch for and gain speed with the gusts, bear in mind that at the start of 2010 I was only making about 1 out of 5 gybes! In short, the freedom and satisfaction windsurfing gives can only be understood by someone who has experienced the feeling of being in harmony with some of the biggest forces nature can throw at us. Could you tell what equipment will be used to reach the 1000nm goal? • A Starboard Carve 133 which is my lightwind cruising board and should really be replaced with a dedicated slalom of around the same size. • A Starboard Kode 112 which is a great board but again not dedicated slalom, it does however keep up with any board of the same size across the wind and will be used to clock up the most miles I think. • A Mistral 95SL RD, this is a pure slalom board for advanced sailors, it has taken about 5 sessions and I am now a lot more comfortable with the change in stance and the difference in feel the board gives. I hope to use this board a lot more as I build in confidence with it. • On top of this I have 2 wave boards and a custom speed board which will rarely get used for this challenge. • A 7.0 Tushingham x15 which will be the workhorse for this challenge, it is brilliant for overpowered conditions but also gets going in light winds unlike my other speed sails. • A 6.3 Simmer XC Race and a 5.8 Tushingham X15 for higher winds, but these do overlap quite considerably in my experience on them, the Simmer needing really overpowered conditions to work, or even get going! • Severne Gators (5.5 - 6.0 - 6.5) which are great all round sails, working both in waves and flat water very well. This should cover me for all conditions, although I would like a bigger cammed sail for the lighter winds and more time on the water but will only get one if I also get a bigger slalom board or replace my Kode with a slalom, the Kode struggles with anything above a 7m due to a short mast track that is quite far back. If all the above fails I have a paddleboard with mast track that I can use in less than 10knots for clock up some miles if necessary. Out of it all if I could choose then I would opt for the Mistral 95 and the Tushingham 7 x15, as these will force me to perfect my laydown gybe and give me good hour speeds along with a lot of miles. Thank you for putting this on your site Erik. This challenge is starting to reach quite a wide audience now which I really did not expect when I thought it up.